Jupp Heynckes has warned his Bayern Munich side to take all of their opponents seriously in the group stage of the Champions League, after they discovered their fate on Thursday. The Bavarians will face Valencia, Lille and BATE Borisov in Group F as they look to make amends for their penalty shoot-out defeat to Chelsea in last year’s final. But while Heynckes is confident of Bayern’s chances in progressing to the knockout stage, he acknowledges that they must not underestimate their rivals if they are to top the pool. “It’s definitely a manageable group for us, on paper. But the Champions League is difficult and you have to respect all your opponents. We’re certainly looking forward to it,” Heynckes told the club’s official website. Bayern sporting director Matthias Sammer shared a similar view, pointing out that Valencia could prove to be a difficult encounter. “It’s a draw which presents medium difficulty,” mused the 1996 European Footballer of the Year. “Our aim is clear enough: we want to make the next stage as group winners. If we turn in strong performances we’ll impose ourselves on the group, but if we’re in poor shape we’ll have problems. Goalkeeper Manuel Neuer, who proved to be Bayern’s hero in their Champions League semi-final victory over Real Madrid last year, expressed how it was an easier draw than last year’s, when they were drawn against Manchester City, Napoli and Villarreal. “Valencia came third in Spain behind the big two of Barcelona and Madrid, and Lille have played quite a few games in the Champions League,” he commented. Bayern Munich’s Champions League campaign begins on September 18, when they will host Los Che at the Allianz Arena. A host of Europe’s top strikers look set to battle it out for the Champions League top goalscorer prize after the draw was made in Monaco on Thursday evening. Last season’s top scorer Lionel Messi achieved an incredible 14 goals to win the prize, despite Barcelona failing to make the final of the competition, a fact that makes his feat even more impressive. The Argentine has been named as the favourite to repeat his goalscoring heroics this season, priced at 9/4 with William Hill. Barcelona will face Benfica, Spartak Moscow and Celtic in the group stage and it is expected that Messi will have a good chance to record a significant total in the first six games. Cristiano Ronaldo was not the most prolific for Real Madrid in Europe last season, but he is tipped to be the player best equipped to challenge Messi’s dominance. He’s available to back at 6/1 for the top scorer award. Jose Mourinho’s side will play Manchester City, Ajax and Borussia Dortmund in their group. Bayern Munich striker Mario Gomez was Messi’s closest challenger last season and, in other years, his total of 12 goals may have been enough to see him win the award. The German striker was clinical and his goals were vital in Bayern reaching the final, where they lost to Chelsea. Gomez managed to net four of his goals in one match; the emphatic 7-0 win over Basel. The Bavarians’ group-stage opponents will be Valencia, Lille and BATE Borisov, and Gomez can be backed at 7/1 to score the most goals in the competition. Fernando Torres looks to have re-discovered his goalscoring form and punters who think he could be the one to break the Clasico stranglehold can back the Chelsea frontman at 16/1 with William Hill. Manchester United’s biggest signing of the summer, Robin van Persie, has plenty of Champions League experience and he is next in the market at 16/1. Barcelona were handed a favourable group in the Champions League as they aim to secure a third title in five years. The Catalan giants have been drawn against Benfica, Spartak Moscow and Celtic. They are now 5/2 to win the tournament. Of the English sides, Manchester United and Arsenal have both been cut in price, now available at 15/2 and 20/1 respectively, while Chelsea are unmoved at 14/1. The Red Devils were drawn with Braga, Galatasary and Cluj. The Gunners seemingly favourable draw sees them meet Schalke, Olympiakos and Montpellier. The toughest group looks to be that of Real Madrid, Manchester City, Ajax and Borussia Dortmund. A group which contains four domestic champions from last season. Madrid are still expected to progress priced at 7/2 to win the tournament but the draw has seen Manchester City pushed out to 9/1 by Paddy Power, a price that could prove very attractive for punters who believe Roberto Mancini’s side can claim thier first Champions League title. Paris Saint-Germain have also been snipped from 16/1 into 14/1 while beaten finalists Bayern Munich are unmoved at 12/1 following their draw against Valencia, Lille and BATE Borisov. The three debutant teams remain at huge prices to claim a Champions League victory at the first time of asking. After being forced to sell key players Santi Cazorla and Solomon Rondon this summer, Malaga are priced at 66/1 after the draw. Montpellier are 125/1 shots and Danish side FC Nordsjaelland are still given almost no chance by the bookmakers, priced as they are at 1000/1. 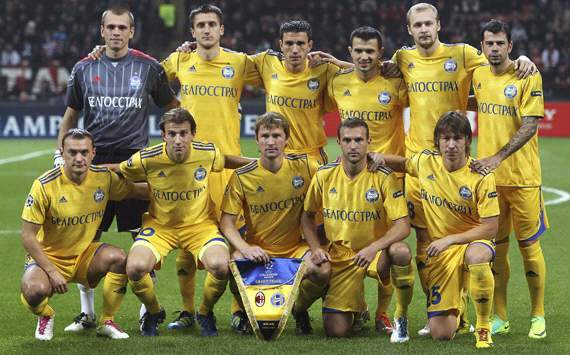 They will line up against defending European champions Chelsea, Shakhtar Donetsk and Serie A winners Juventus. The first leg of each of tie will be played on 18/19th September. When fit, the Dutch winger is one of the very best players in the world, and certainly the most dangerous in Jupp Heynckes’ squad. Robben carried his team to the final two seasons ago, including stunning goals against Fiorentina and Manchester United, and if he remains healthy, he could set the tournament alight again in 2012-13. Soldado joined Valencia in 2010 and has since hit 55 goals in 97 games for his hometown club, including two in as many matches this term. Valencia were knocked out in the group stages of the Champions League last season as Chelsea and Bayer Leverkusen progressed, and even though they advanced to the semi-finals of the Europa League, the Spanish side will look to Soldado (who recently rejected a move to Tottenham and wants to spend the rest of his career at Mestalla) to fire them to greater things in Europe this time around. Not surprisingly, Kalou has netted for his new club already despite having only sealed a move to the French top flight in July. Boasting a wealth of European experience from his time with English champions Chelsea, the Ivorian’s pacey runs and guile on the ball will be called upon to ensure the Ligue 1 side create plenty of chances on Europe’s biggest stage. The 31-year-old is without a doubt the most famous Belorussian player of the 21st century, and returned to the club where he started his professional career this summer. Hleb has enjoyed spells at big clubs such as Stuttgart, Arsenal and Barcelona, and even though he’s no longer the player he was during his peak years, the attacking midfielder is still a force to be reckoned with.